This script is now obsolete. gmailUnlabelled is a greasemonkey script for gmail that creates a special label -- Unlabelled to search for all the conversations without a real label. Download the latest version here. The source is released under GPL v2 and a full revision history is available here. You can watch for changes by subscribing to the RSS feed. Install the greasemonkey extension and restart firefox. Click here to obtain the latest version of gmailUnlabelled. Greasemonkey should prompt you for confirmation to install the script. Refresh gmail. You should see a new link just above "edit labels". You can also type "-label" in the gmail search box. These browsers directly support userscripts. Click here to obtain the latest version of gmailUnlabelled. Your browser should prompt you for confirmation to install the script. Click here to obtain the latest version of gmailUnlabelled. GreaseKit should prompt you for confirmation to install the script. Refresh gmail and search away! The search may throw up 'conversations' with a label. This indicates that at least one 'individual email' in the conversation does not have a label. For instance, emails sent or received in a conversation after you added the original label to the conversation are not tagged with that label automatically. The gmail display can be misleading in this scenario. 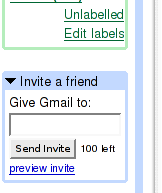 This is typically seen the first time you use !gmailUnlabelled. If you have too many labels, the search string gets too long and gmail complains with an error 600 or Oops… the system encountered a problem (#6400). If labels are moved from their original position, for instance to the right side. For the older version of gmail, use the earlier script (history). This version is not maintained anymore. What is the gmail account type - regular personal gmail account vs google apps account? Does any other user-script work for you? If the script ever worked, when did it stop working? Copyright © Jaidev Sridhar. Licensed under a creative commons license.